The lightly vanilla-scented tapioca is a perfect complement to the sweet, fresh fruit in this fat-free vegan dessert. They’re also low in sugar and naturally soy- and gluten-free. Red, white, and blue and good for you too! Silly as they are, those are the words that popped into my head as I sat down to write about these luscious parfaits. 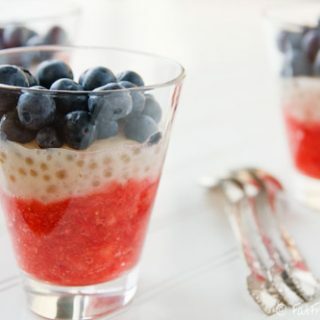 I had the Fourth of July on my mind when I started planning a dessert with strawberries and blueberries, but it occurs to me now that these two summer fruits, connected by a layer of vanilla-almond pudding, are more than just a pretty color scheme: They’re nutritional stars, too. Blueberries routinely top the lists of healthiest foods, their dark blue color harboring antioxidants that are thought to reduce cholesterol and triglycerides and even reverse memory loss. But strawberries are also no slouch in the health department; their phytonutrients are associated with reduced deaths from cancer and protection from rheumatoid arthritis. Antioxidants and phytonutrients are all well and good, but if you’re looking for a fun and festive dessert for your Independence Day celebration, heath benefits may not be your primary concern. You want something that tastes as spectacular as it looks. Well, let me help you out: These parfaits will be the hit of the party. The lightly vanilla-scented tapioca is a perfect complement to the sweet, fresh fruit. They might be a little time-consuming to put together, but once they’re made, they can chill in your fridge for hours until you’re ready to serve dessert. And here’s a bonus: Besides being loaded with healthy fruit, they’re low in sugar and naturally soy- and gluten-free. Let the fireworks begin! Stirring often while simmering over low heat are the keys to keeping the almond milk from scorching. Have ready: A deep metal bowl and a larger bowl, filled halfway with ice and water, that the metal bowl fits into with space around the sides. Place 2 1/2 cups of almond milk and the tapioca into a heavy saucepan. Bring to a gentle boil, stirring occasionally, and then turn down the heat to a simmer. Stir well every few minutes, scraping the bottom and sides to prevent sticking. Cook until the tapioca pearls are mostly translucent, 15-20 minutes. Mix 1 tablespoon of the reserved almond milk with the cornstarch and set aside. Add the remaining almond milk to the pan along with the sugar and vanilla bean. Increase heat and return mixture to a slow boil. Continue cooking and stirring for 5 minutes. Stir in the cornstarch mixture and cook until mixture thickens. Remove from heat and pour pudding into a deep metal bowl. Remove the vanilla bean, scraping it down with a spoon to draw out some of its seeds, and place the bowl in the prepared ice bath. Stir it every few minutes until it cools, about 10 minutes. While the pudding is cooling, cut the strawberries in quarters. Put them in a food processor along with the agave nectar and pulse until coarsely pureed. Divide the puree among 6 small glasses (8-oz. juice glasses or wine glasses work best). Once the tapioca is cool, divide it equally among the 6 glasses, spooning it gently atop the strawberry layer. Refrigerate for at least 15 minutes, until well chilled. 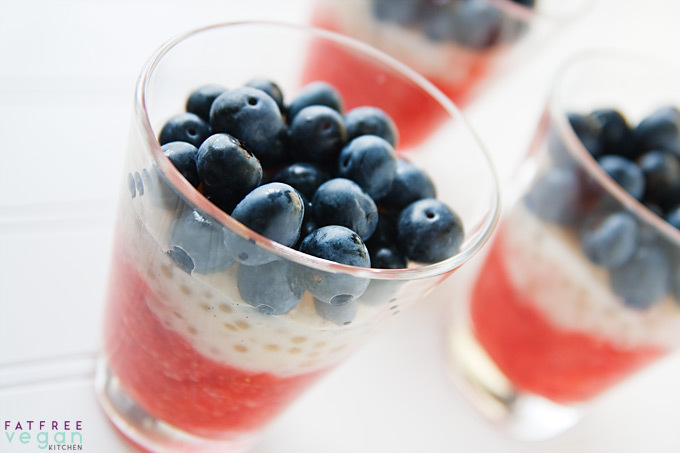 Add a layer of blueberries to each parfait and serve. I haven’t tried a sugar-free version, but I can see no reason why stevia couldn’t be used to replace the sugar and agave nectar. What a lovely summery idea. I don’t normally do the 4th July (I’m a Bastille Day girl) but I might make an exception for these. This looks wonderful….I will be making these for our fourth of July…thanks for sharing!! I’m totally making these! They are so pretty and sound delicious! These look so delicious I wish I had the fruit so I could make them for brunch! Wow–I have missed tapioca! Do you think that minute/instant tapioca would work in place of the small pearl? Oops sorry, there was a typo in my webpage address! I hope it’s fixed now. Very yummy looking! I am avoiding gluten and taking a break from soy so this sounds right up my alley. Wow, that’s my kind of dessert! Do you think it’d still work if I subbed soy milk and frozen strawberries (we happen to have lots and lots of them)? Yes to both questions, Sina! I love the grain-free parfait idea. 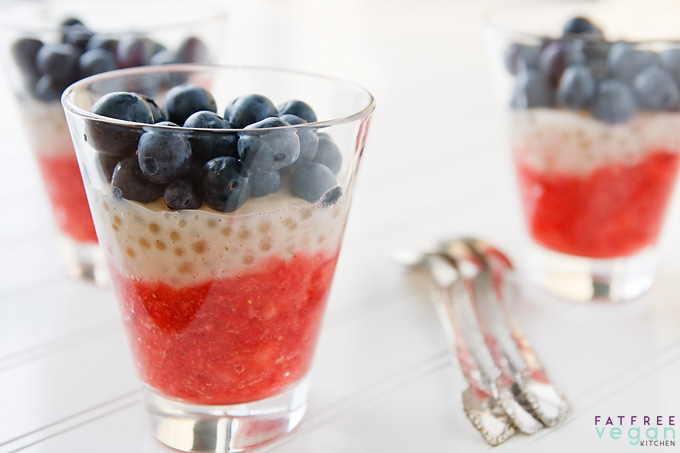 But instead of tapioca, I’m going to make a chia seed pudding (the texture is similar to tapioca). Chia is AWESOME – healthy, filling (fiber! ), protein, and fats. It can also be used to replace oil, eggs, or gluten in a recipe. Those are adorable, and they look so sophisticated. I’m so glad it’s strawberry season! 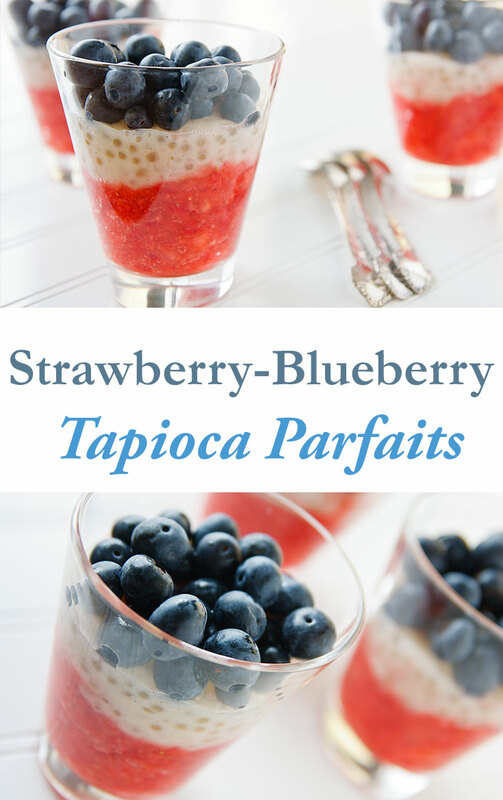 We have just added your latest post “Strawberry-Blueberry Tapioca Parfaits” to our Food Directory . You can check the inclusion of the post here . We are delighted to invite you to submit all your future posts to the directory for getting a huge base of visitors to your website and gaining a valuable backlink to your site. Oh I LOVE it!!! Great idea! Wow, that looks pheonominal! I love tapioca, but never make it because the hubby doesn’t. I think I need to claim some culinary independence and make it for myself! OMG! I LOVE tapioca pearls more than life itself! I’m such a bubble tea head…I know I would love this! These are very cute! 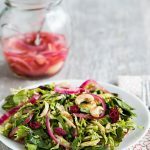 I might have to make them for July 4th, with the rest of our menu from your blog (the BBQ seitan, and either the quinoa or kasha salad). But I wanted to ask about your polenta dish from a few days back, but the comments are closed there because of the DVD contest you ran. Did you use regular polenta, or the larger “corn grits” polenta? I read in one of Lorna Sass’s books that pressure cooked polenta calls for the corn grits rather than the smaller traditional polenta. Did you use the smaller kind? And if so, did it work?? Hi Nicole, I used the “corn grits” polenta, the kind made by Bob’s Red Mill. I hope you enjoy it, as well as your 4th of July meal. Thanks for writing! This looks delicious! I’m not American, but we might be celebrating a little red, white and blue with these this weekend. LOVE this idea!!!! I havent cooked with tapioca in a long time!! 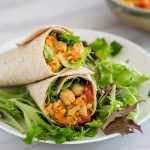 I love your blog – most vegan recipes are so concerned about the lack of animal products that they tend to overcompensate with fats, and it’s so nice to see you making up so many different recipes without them! I’m currently making a film on how food affects us and the planet, the trailer is at http://www.planeatthemovie.com. HEY! Congrats on the nominations from vegnews magazine! This might seem like a stupid question, but where on earth does one buy tapioca balls? I can’t remember ever having seen them anywhere, except the huge black ones for bubble tea. Would Whole Foods or Trader Joe’s have it? Jaimee, almost any big grocery store will have them. Look for them somewhere by the Jello and instant pudding boxes. There’s also an instant version, but I haven’t used it and don’t know if it would work with this recipe. 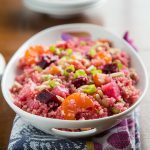 This looks absolutely delicious, any time of the year. . .I’ve been wondering how I could make vegan, low fat tapioca. . .now I know! Thanks! The Strawberry-Blueberry Tapioca Parfaits looks really really good. I am gonna make this for my family these weekend. Hi Susan, the parfaits look so lovely and festive! And healthy with those berries, wow. These are so festive and fun! My children could plow through a pound of strawberries a day, but tapioca pudding would be new to them. What’s particularly nice is that this recipe fits a lot of diets that might not normally include such a great dessert! Can I replace vanilla bean with vanilla? If so, how much? This is a delicious looking treat. What a great idea! We had beautiful fireworks in our area. Happy 4th! What a yummy treat! Fresh berries and tapioca – that sounds like the perfect combo! mmm this looks so good! i bet this would be an amazing breakfast too bad i dont have any pudding on hand. i shall make this tomorrow morning! This will be the best parfait ever! Thank you so much for your post, its awesome! Strawberry and blueberry in one recipe is simply heavenly! I love all summer berries and this looks great. I’ve made tapioca with coconut milk (not good on your site) with great success. I wonder if you can do it with coconut water instead, since I love coconut. Don’t get me wrong, almond is good, too. What a wonderfully delicious idea. Happy 4th . oh, this was just right for our family 4th of july dinner! everyone loved how festive it was, and the older generation especially appreciated having tapioca pudding. thank you! 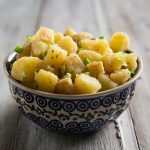 We’d like to feature this recipe on Made Just Right, Earth Balance’s website for a plant-based diet on Monday. Can you please contact me, Amber, afonzen@eqal.com, regarding this? I am diabetic. This recipe has way too much sugar and carbohydrates. People who are diabetic or counting carbohydrates or sugar should stay away from this, it also has too many calories for us. I’ve wanted to make a version of this for the longest time. Today I made my own almond milk (I was amazed at how easy that was and how good it is), and my yard is full of raspberries, so I thought this would be a good time. But I had only about two tablespoons of tapioca–since it’s only me I “thirded” the recipe. It came out very nicely. I don’t know why I thought the ice bath was going to be complicated. It was all really quite straightforward. I will keep experimenting with this template. Thank you! This looks great! My wife just went out to get the ingredients to make it! 🙂 Thank you for the recipe!